Brainstorm other standards of behavior that applied to girls in days past. Think of standards that still apply to nice girls. Are there any? Do they apply to the general population or to a distinct sub-set? What sub-set would that be? Begin a short piece based on a conflict over standards of behavior. I’m sure you are familiar with the saying that the apple never falls far from the tree. Driving north from Silver City, New Mexico, we pulled over to read this historical marker. Of interest was the Camino Real, the 1,600-mile road from Mexico City to San Juan Pueblo, NM. After Cortez took the Aztecs in 1521, the first leg of the camino linked the Old World of Spain with the New World. Starting in the port of Veracruz, the road went west to Mexico City. Later, a second leg went north from the smelters in Mexico City to the silver-laden Zacatecas Mountains. In 1603, the third leg followed the route of Juan de Onate who headed north to colonize the interior. Onate and the Camino Real made it possible for the colonists, missionaries, and the supply caravans to provision the Spanish settlements along the Rio Grande. The Camino Real was a super-highway for over 350 years and was only diminished in importance by the arrival of the Atchison, Topeka & Santa Fe in 1885. 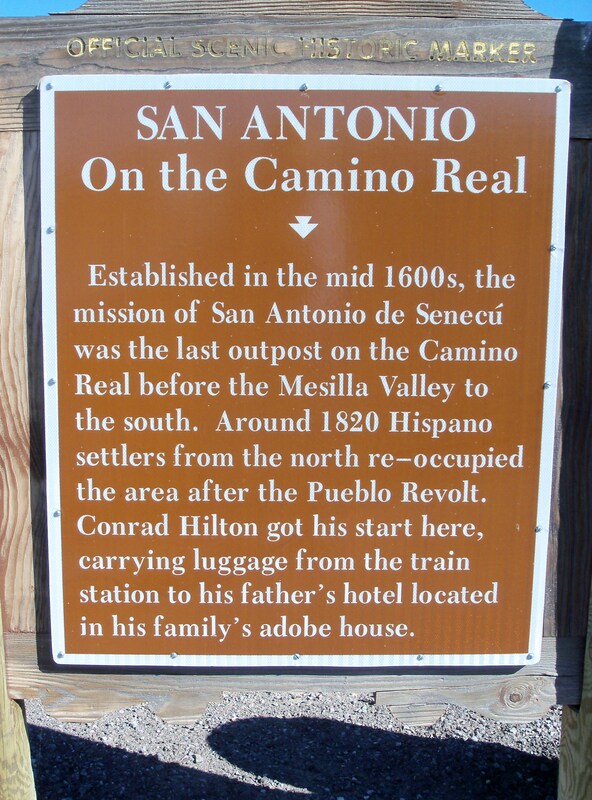 At which point, as the sign says, Conrad Hilton (1887-1979) one of eight children born to a Norwegian immigrant, carried passenger luggage from the station to his father’s adobe house which served as a hotel. I love stories of humble beginnings and self-made men. Looking at the inhospitable landscape and knowing the area’s savage history, it is easy to appreciate the young Conrad making his way to fame and fortune who on his death bequeathed the greater portion of his fortune to philanthropic causes. As I read the sign, my mind flitted to the younger generation, and Paris Hilton came to mind. I looked for a photo of Paris, but none seemed just right to juxtapose against the historical marker. None seemed quite right until Saturday, Nov. 20th. Here we have Paris, stylish in her skinny jeans, designer sun glasses and stilettos, whittling away on her court ordered 200 hours of community service for possession of cocaine. She’s painting over graffiti on Hollywood Boulevard, Los Angeles. Her great-grandfather Conrad Hilton was a giver. Paris is a taker. Someone said, “There’s no such thing as bad publicity.” Paris didn’t say it, but she might have. Paris is one apple that fell from the tree, rolled downhill, and fell in a ditch. So much for the apple not falling far from the tree.